The Ministry of Education and Sports and BEQUAL program held their second Steering Committee in February to review the progress after nearly two years of implementation and endorse the Annual Plan for 2016-2017. The BEQUAL Steering Committee was chaired by H.E. Madam Sengdeuane Lachanthaboune, Minister for Education and Sports, and co-chaired by H.E. John Williams, Australian Ambassador to Lao PDR and H.E. Leo Faber, European Union Ambassador to Lao PDR. H.E. Madam Sengdeuane acknowledged the long term cooperation between the Ministry of Education and Sports and the Australian Government and European Union. “BEQUAL is a 10-year program comprised of three phases focusing on the 66 most educationally disadvantaged districts”, said Minister Sengdeuane. “It is a large program, and the Ministry of Education and Sports has never implemented such a large program before”. BEQUAL will help an estimated 450,000 children receive a better quality education, with a particular focus on children who traditionally experience poorer education outcomes – girls, students with disabilities and children from remote communities. “The European Union has long term commitment to support the education improvement in Lao PDR, our partnership with Ministry of Education and Sports and Australia through BEQUAL can bring a real positive change in quality of education services in school level.” Ambassador Faber emphasized the importance of reflecting lessons learnt from local level into curriculum and teacher reforms. The meeting highlighted the significant progress made by the program in establishing the necessary foundation for greater coordination. A key milestone was the agreement with MoES on a revised primary curriculum framework. Also, in 2016, the program supported MoES to start an ambitious national Assessment of Student Learning Outcomes (ASLO test). In May 2017, the test will be used with almost 17,000 Grade 3 students, allowing MoES, for the first time, to have accurate information about learning outcomes at provincial as well as national levels. Moreover, in 2016, 169 new ethnic teacher trainees were selected to join the Ethnic Teacher Scholarship Program. A total of 385 trainees are now studying in three Teacher Training Colleges in Luang Namtha, Savannakhet and Saravan provinces. On graduation, these trainees will return to their home villages in the most educationally disadvantaged areas of Laos, and will improve access to and quality of education in remote and rural communities. Furthermore, the Steering Committee discussed and endorsed the forward work program contained in the Annual Plan. Amongst the key activities to achieved the program objectives, in 2016-2017 BEQUAL will complete the trial of new Grade 1 textbooks, teacher guides and other curriculum materials, providing invaluable insights into the changes that are needed to make the new curriculum effective. A revised framework for teaching standards and a new program for professional development for TTC educators will also begin to be implemented. These two activities are essential to improve the quality of teaching in primary schools in Laos. Under the current annual work plan, 5,130 Grade 1 children in 171 schools will benefit from new Lao language and school readiness courses, and 19,795 children in 171 villages will benefit from community action activities supporting literacy and reading promotion. 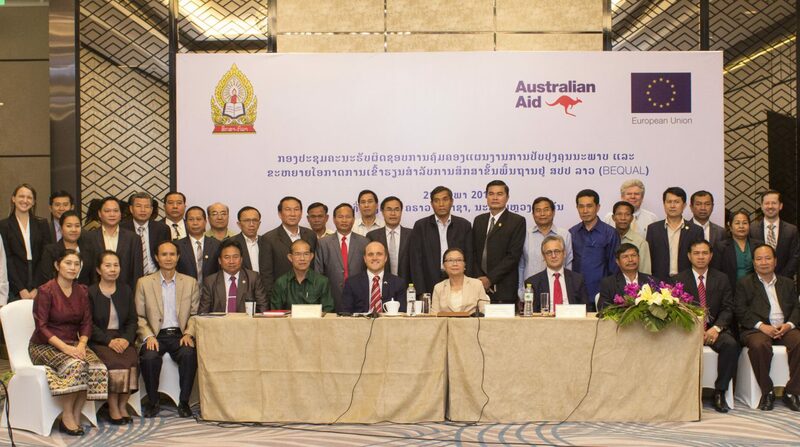 Ambassador Williams said the partnership between the Ministry of Education and Sports, Australia and the European Union had the potential to make a real difference to the quality of primary education in Laos. “This is the first time a single program has supported the Ministry to update both the national primary curriculum and the national teacher training curricula. This provides a unique opportunity to ensure the curricula is aligned, coherent and impacts on learning outcomes” said Ambassador Williams. Among the 70 participants were Provincial Vice Governors, Heads of Provincial Education and Sports Services offices, Senior Managers of Ministry of Education and Sports (MoES) departments and Teacher Education Institutes, representatives of other central line ministries, BEQUAL technical advisers and development partners.